2Aries – Don’t say things you do not mean. 3Taurus – There is nothing wrong with being vulnerable. 4Gemini – Stop hesitating, now is your time. 5Cancer – If you don’t figure out what you want, you’ll never get it. 6Leo – Go with the flow. 7Virgo – You are not your thoughts. 9Libra – Give yourself the break you deserve. 10Scorpio – The smallest changes make the biggest differences. 11Sagittarius – Be more optimistic. 12Capricorn – Don’t feed into any drama that comes before you. 13Aquarius – Stop being so cold towards the people you love. 14Pisces – Think outside of the box. With the new moon coming up in Sagittarius, we are all in for a wild ride. This new moon will not be like any other and that is something I cannot stress enough. This new moon is going to occur on the 7th of December and will be the last new moon of the year. It will be coming forth with a sense if sinister influence that most people will not be able to handle. Many of us will be irritated and disappointed but overall we will be facing some quite complicated situations. 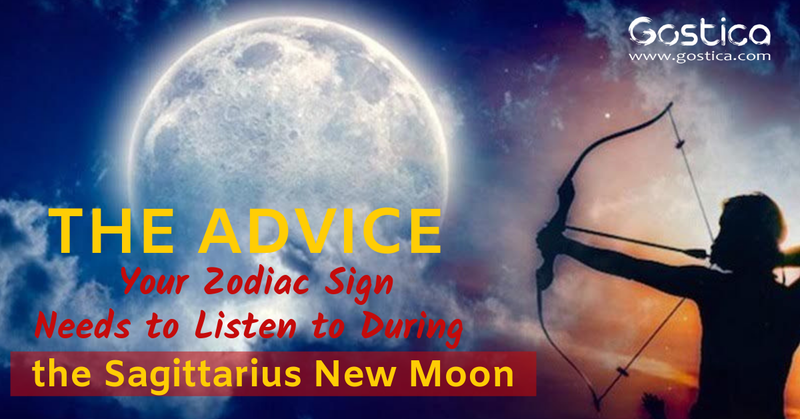 This new moon holds different things for each sign and with that, there are pieces of advice that each should keep in mind when it comes to getting through this with the most minimal damage. Because Mars will be conjunct Neptune we are going to be feeling quite aggressive and some of us will be very paranoid. Not much positive is going to come in regards to how we will be feeling during this new moon. Below I am going to go over the piece of advice that each sign should really end up resonating the most with as the days following this continue forth. Do your best to remain grounded, while your intentions may be good there is a lot going on behind the scenes in the world of the celestial bodies. This might really help you get through some of the roughest moments of this new moon. Aries – Don’t say things you do not mean. During this new moon, you are going to be dishing out a lot of harsh words and bringing a lot of things to light. Do your best to make sure that you’re thinking things through. Once you say something you cannot take it back and you need to keep that in mind. Taurus – There is nothing wrong with being vulnerable. During this new moon, you will be showing your vulnerable side much more strongly than you ever have before. People are going to be finally seeing you for who you truly are and this is not a bad thing. While you will feel the need to run and hide, you shouldn’t. There is nothing wrong with showing your true colors sometimes. Gemini – Stop hesitating, now is your time. While you might usually be the kind to question things now is not the time to do that. You are headed towards something great and you need to take it all in. Everything you’ve been working for is about to pay off, see where these energies take you and enjoy the ride. Cancer – If you don’t figure out what you want, you’ll never get it. You are far more unsure of yourself than you realize. If you don’t figure out where you want to be in life and who you are things will never change. You can’t ever have what you want if you don’t know what that is in the first place. This new moon is going to have you doing a lot of soul searching and through all of that, so you might come to a very unexpected conclusion. Leo – Go with the flow. Now is not the time to try and break the status quo. Just give yourself time and go with the flow. While it might not seem like it something you deserve is on its way to you. You might lose track of yourself but everything will work out in the end. These energies won’t be tearing you apart, relax. Virgo – You are not your thoughts. While you will be deep in your feelings during this new moon you are not a product of your thoughts. You define who you are and you choose what thoughts to give power to. Just because things might be a bit confusing doesn’t mean that you have to give in to all of the things that are making their way into your mind.